"Green Swamp- Right side detail"
Michael Rothman DescriptionThe Green Swamp of North Carolina is a Nature Conservancy area encompassing some of the last remaining Wiregrass-Long Leaf Pine habitats of the American South East. The area is considered to be a region of enormous botanical biodiversity. 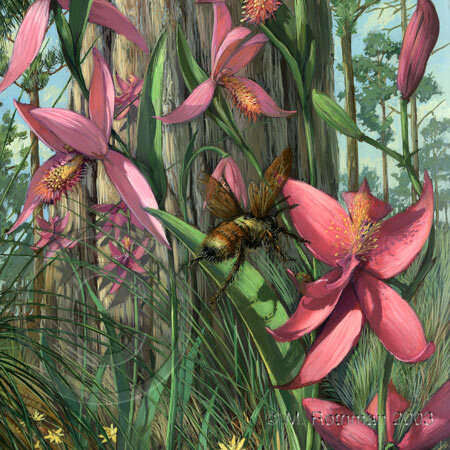 The flora includes a substantial number of vanilloid orchids and carnivorous plants, such as the Venus flytrap and the Yellow pitcher plant. The painting was prepared under the aegis of Dr. Ken Cameron of the New York Botanical Gardens.